Wow. 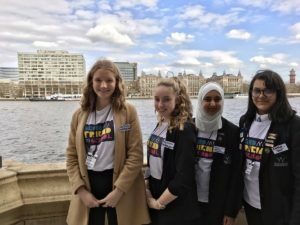 It’s so amazing to see all the fantastic youth action happening all around the country for the #MakeSchoolsSafe campaign – over 150,000 UK school students are taking part so far! Haven’t got involved yet? What are you waiting for? The Week of Action is coming up on 18-22nd June – this would be a perfect time to get involved. Download your Teacher’s Pack now with everything you need to get the campaign going in your school. 1. 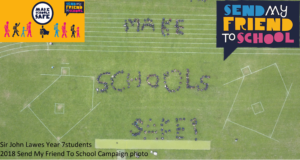 Year 7 students from Sir John Lawes School in Hertfordshire used their bodies to create this incredible Make Schools Safe aerial photo in their school field! It received a lot of attention on social media, even Penny Mordaunt MP, Secretary of State for International Development tweeted about it. 3. Over 250 children, staff members and authors (& two horses!) 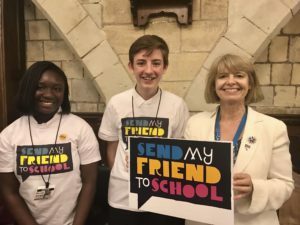 from eleven schools took part in a 75-mile #BaytoHay relay walk from the Welsh Senedd (Cardiff Bay) to Hay-on-Wye to raise awareness for Send My Friend to School. 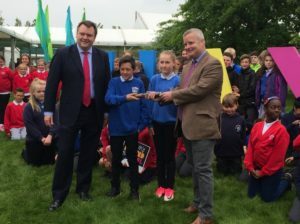 They collected #MakeSchoolSafe letters from each of the schools in a baton which they presented at the Hay Festival to two MPs, Chris Davies and Nick Thomas-Symonds. 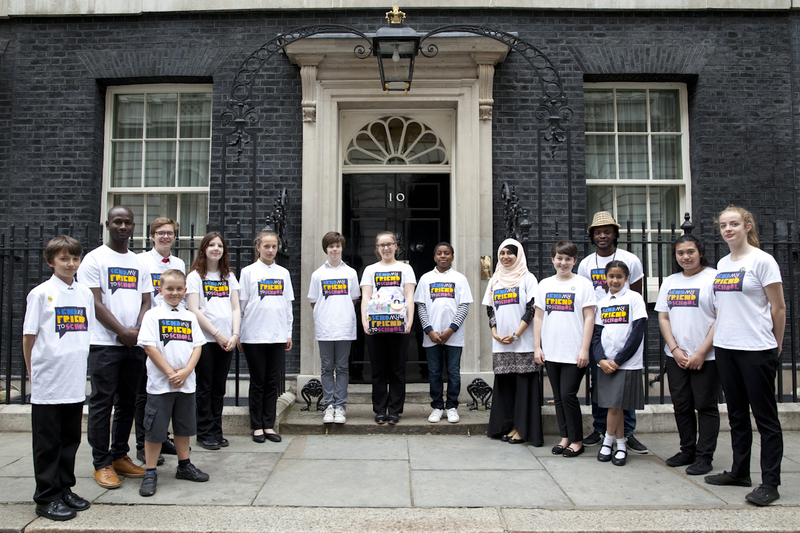 The two MPs alongside the schools and the Hay Festival are now planning a final leg of the baton’s journey – taking it to Number 10 Downing Street before the end of term! 4. 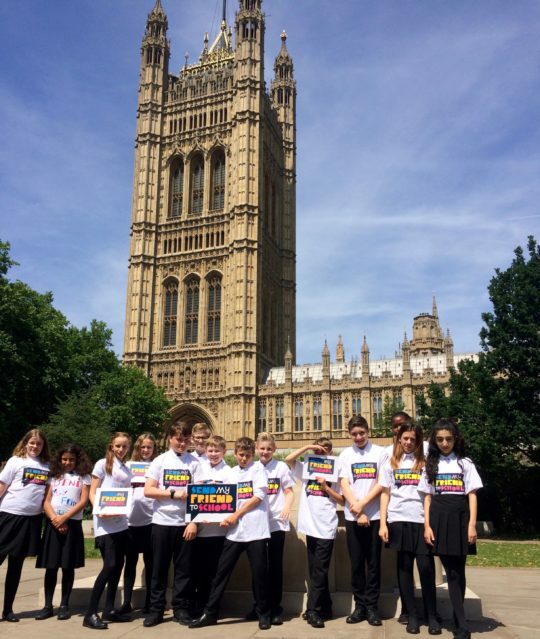 Year 8 students from Longdean school in Hemel Hempstead met with Secretary of State for International Development Penny Mordaunt MP, alongside their local MP Sir Mike Penning. 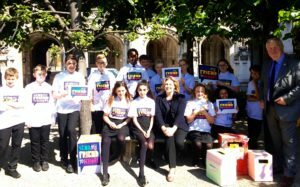 The young campaigners presented their ideas on global education, the work that they had been doing to promote the campaign in their school and presented some boxes they had made with signatures of support from other students. The Secretary of State was very receptive and spoke to the campaigners about why education is important and the work that DFID is doing on girls’ education specifically. Huge well done to everyone involved in the campaign across the country. If you haven’t already, do download your Teacher Pack and join our Week of Action 18th-22nd June (or anytime if that week doesn’t suit). Got any questions? Just get in touch.